You might not have noticed it, but crafts are starting to go geek. There is more information available on the Internet about crafts than ever before, and there are whole genres of crafting devoted to crafts that can be done on the computer. LovetoKnow already includes some information about digital scrapbooking, but we don't talk a lot about the more general arena of computer crafting, where the computer is used to make crafts that are printed out and often assembled into something that has a life beyond pixels on a screen. This month I talked to Macelle Costanza, author of the new book Creative Computer Crafts about her favorite crafts and how to get started making crafts from your computer. LovetoKnow: How did you get started computer crafting? Marcelle Costanza: It all started with a DOS based PC and a dot matrix printer I had in my office where I worked in the mid 1980s. A doctor I worked with gave me a print program and I started making banners. Co-workers started asking for banners. In 1995 when I bought my very own computer and an inkjet printer, it came with a creativity program. Once I realized I could make my own greeting cards and color banners and t-shirt transfers, I was hooked. I soon bought a bigger and better computer and printer, started taking classes in photo editing and design, got a hold of every program I could get my hands on and before long I was hooked. LTK: From digital scrapbooking to designing greeting cards on computer, crafting has certainly gone geek. Why do you think crafters have embraced technology so much? MC: I think folks have come to embrace the computer as a creative tool because it enables them to take their crafting to a higher level. Craft shows on television have definitely helped in the past few years. Crafters are now realizing there isn't much they can't do with a computer and a little imagination! LTK: Some people are really intimidated by technology. What do you tell beginning computer crafters so they won't be afraid to try this medium? MC: I've had some emails from folks who visited my website and were looking to do something special but didn't have the computer skills. One woman in particular was in a panic. First I calmed her down and then told her that the computer is nothing more than a tool and that there is no reason to be intimidated. I then walked her slowly through the steps to do what she wanted-it involved photos-after doing one or two of them for her. Less than a week later I got another email from her. She was so ecstatic that I almost busted out laughing. She had completed the project-which was for an award ceremony for her son-all by herself. She was so grateful because I took the time to teach her. MC: Anything and everything! I get inspiration from magazines, catalogues, television, items I see while shopping, and questions from folks asking if such and such is possible. Most of my ideas come to me while I'm lying in bed at night. Maybe because that is the only time I am not running like a lunatic! LOL! LTK: How do you come up with such amazing computer crafts? MC: I've been crafting for over 25 years. And I was a very creative child, drawing, writing, painting, etc., from about age 7. I guess that creativity is just ALWAYS on and when one of those ideas hits me in the middle of the night, I invariably wind up getting out of bed and going down to my computer to see if it is possible to do. LTK: Do you do any crafts that don't involve the computer? MC: That's how I started. But these days there is little crafting I do that doesn't involve my computer in some small way. I do still draw and I also sew (another skill taught by Mom when I was a small child) and there are still a few crafts I do without the use of a PC. LTK: Your business is called The Crafty PC, so I'm pretty sure I already know the answer to this one, but I have to ask: Mac or PC? Why? MC: PC-simply because that is what I learned on-back in the days where Windows did not exist. I worked on Macs a little bit, but my main reason for my preference is that, unfortunately, a lot of the creative suites that are available for PCs are not available for Macs. With the coming (fingers crossed) of the new Mac OS that is supposed to be just like Windows, hopefully this will change. MC: That's easy-the Music Box Carousel [pictured on the cover of the book]. The reason being that this project came to me as an entry in a crafting contest I ran on my website. The girl who submitted this project had never created anything before and never in a million years thought she had a chance at winning. The idea of the contest was that the entrants had to use as particular item-in this case a spindle from a pack of CDs-and use their computer to make something out of it. We got some wonderful entries, but this one was hands-down the best. And the winner could not believe she had won. I actually had to convince her it wasn't a joke! The reason it's my favorite is because the winner wrote to me after the contest and told me that she now had confidence that she never had before and she would continue to squeeze those creative juices. That's the kind of stuff that makes it all worth it for me even on those days I'm so overwhelmed I'm about to chuck the whole thing. It never seems to fail-I'm up to my earlobes and totally fed up and I get an email from someone who makes me smile and remember that this is why I got into the business to begin with-to spread computer crafting around the globe! LTK: What is your favorite computer crafting tool, other than your computer? Is there a paper you really love, or a program you can't live without? MC: Oh, there are WAY too many papers I love, but there are only two programs I cannot live without-Printmaster and Photoshop. 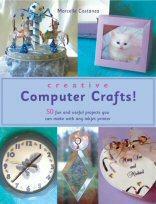 LTK: I love that your book includes a chapter on selling crafts. What do you think is the biggest stumbling block for people who want to set up a business selling their crafts? MC: Well, for computer crafts specifically the problem is the lack of a market outside the Internet. I tried selling at local craft fairs but they were not the right venue. People came to my table and were clueless as to what a computer craft was. On the Internet probably the biggest stumbling block is getting a share of the market. A website has to be catchier than the competition, has to offer things the competitors don't and above all has to offer the BEST customer service on the planet. I sell a few finished products-the bulk of my business online is retail, but customer service HAS to be number one. It has often meant that I had to go above and beyond-way beyond. But the customers appreciate it and they remember it and that's what keeps them coming back. When I look at the customer ratings for my website, customer service is one of the things mentioned most often. MC: Only that computer crafting is a rapidly growing genre-so get in there and have fun! And if they need help-they know where to find me! This is a really fun book that anyone with an inkjet printer should check out. The variety of crafts that can be done with your computer is just amazing. There's a clock, cards, a picture frame, the aforementioned carousel, a candy wrapper, a notepad, a memory book and more. These projects utilize the latest in cool technology including fabric sheets you can run through your printer, inkjet transparencies, even inkjet paper that can be printed on and then shrunk (used in a clever wine glass charm project). As you flip through this book you'll find yourself saying, "I had no idea you could do that with a computer and printer!" And you'll find yourself wanting to do that with your computer, and probably try your hand at designing your own projects as well. Costanza's book is very reassuring and will let you know that you can do this even if you've never used your computer for a craft project before. This book may just convert you to the land of the geeky crafter!